Earth-Feather coordinates the MMIW Washington group that aims to stop violence against Native women and children by advocating for social change in our communities. MMIW Washington recently worked with state legislatures to write a new state law that goes into effect in June. House Bill 2951 is designed to open up the reporting and data-gathering on missing Native women. By requiring Washington State Patrol to work with tribal law enforcements and the Governor’s Office of Indian Affairs to conduct a study, House Bill 2951 will increase state resources that are greatly needed to combat an epidemic of MMIW. The National Crime Information Database reported 5,712 known incidents of missing and murdered Indigenous women in 2016, while a recent report from the National Institute of Justice found that more than four out of five Native women have experienced violence in their lives. Additionally, the Centers for Disease Control and Prevention calls homicide the third-leading cause of death among Native women ages 10 to 24. And the U.S. Department of Justice has reported Native women living on reservations are ten times more likely to be murdered than those who live off the reservation. 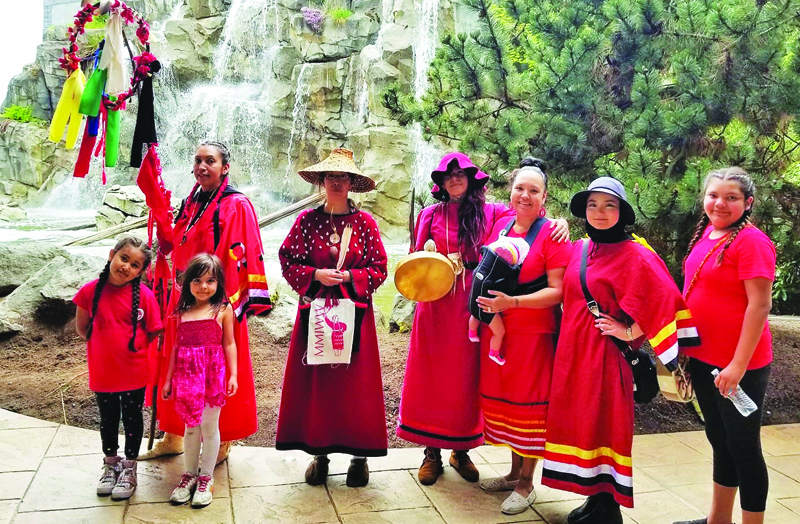 Earth-Feather, along with many members of MMIW Washington, visited the Tulalip Reservation on May 8th as part of their eight-day march from Blaine, Washington to Olympia. 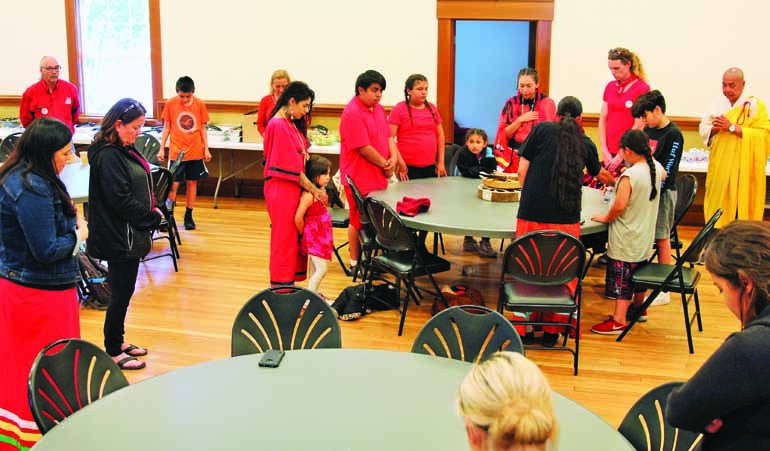 The occasion allowed them to meet with community members and provided an open invitation to all to walk in prayer for their Native sisters who have been murdered and gone missing. 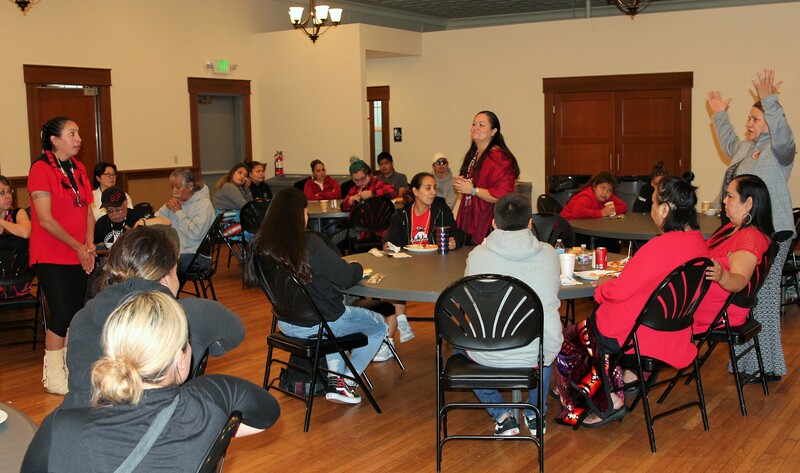 Following the prayer walk and a blessing, the MMIW of Washington made their way to the Dining Hall where a large gathering of community members waited to hear about their mission and journey. An estimated fifty-five people were in attendance, including representatives from the Board, Youth Council and police department. Many of the women attendees dressed in red to support the MMIW movement. After everyone was treated to a catered dinner, they listened intently to the message, first-hand experience and call for action shared by their hosted guests. Tribal member Deborah Parker shared her Woman Warrior Song, which comes from First Nations sisters in British Columbia, and gifted several speakers with custom-made MMIW flags. The evening concluded with the MMIW of Washington members offering song and prayer for those have gone missing, those have lost love ones to murder, and for any women seeking strength. This entry was posted in News, Top Story, Tulalip News and tagged missing and murdered Indigenous women, MMIW, Tulalip by Kim Kalliber. Bookmark the permalink.